Hotcig R233 Box Mod, which can support adjustable voltage, is powered by dual 18650 batteries to fire up to 233W. In addition, magnetic battery cover ensures convenient changing of batteries and high quality zinc alloy material offers up-scale texture. What's more, it has 0.8 millisecond fast firing speed to save your time. Hotcig R233 Box Mod, which can support adjustable voltage, is powered by dual 18650 batteries to fire up to 233W to deliver huge cloud. In addition, magnetic battery cover ensures convenient changing of batteries and high-quality zinc alloy material offers up-scale texture. What's more, it has 0.8 millisecond fast firing speed to save your time. Its panel can be changed to bring color to your life. What are you waiting for? Just get it to enjoy perfect vaping. 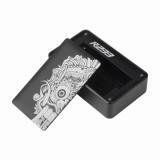 • Three-month warranty for Hotcig R233 Box Mod. 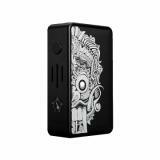 233W Hotcig R233 Box Mod supports 2pcs 18650 batteries, which provides the mod with a max power of 233W. So it is powerful enough for those vaping enthusiasts. The mod has a fast 0.8 second firing time with a cool appearance.